Ecosprinter | What members for FYEG? Though this has been an issue discussed inside FYEG lately, I’m not writing about if the membership at FYEG should be restricted to organizations or include individuals. I’m just wondering : what kind of organizations in our federation ? The statutes say that ecology is a whole and cannot be restricted to protectionof nature, women’s rights and human rights, care for the third world, etc.. All issues that compose ecology but cannot resume it. Entering the FYEG as a member you must show that you care about “ecology (in the broad sense of the term : the environment, social and political ecology)”. Unquote. A question was not raised by the statutes. 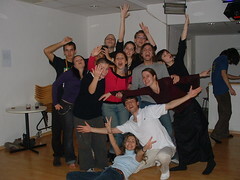 Most of FYEG member organizations (MOs) are the youth organizations of green or left-green parties. Yet some of them are what you could call NGO, independant associations. Chiche ! for example, from where I come, is cutting its last relations with the French green party. Are we still political greens ? Well, I think so, we still want to have an influence on our society (on our city, according to the etymology of the word politics). The specificity of the youth organizations of green parties is not to be political, it is mainly to teach young people how to behave in a political party. This is useful, but I don’t think it’s so interesting. Politics is not only about going at the elections, especially in this bad context for political ecology (French and German greens don’t have a real influence on their countries’ politics, do they ?). It can be also spreading green ideas in a society that is still very unsustainable. So I stand for having inside FYEG all kind of youth organizations who are fully green, not considering their way of action. They could be direct action networks, they could be think tanks, they could be a magazine or a resource center, any kind of activity that consists in spreading green ideas. Because I think our job as young greens is to change society from inside. Tagged European Green Party, Federation of Young European Greens, FYEG, Green politics, The Greens. Bookmark the permalink.